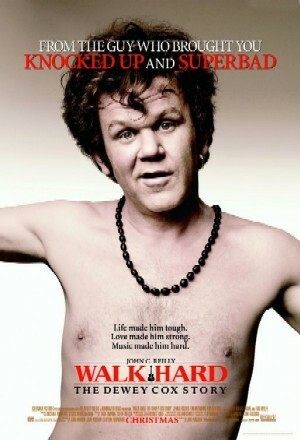 Walk Hard: The Dewey Cox Story is a 2007 American comedy film, directed by Jake Kasdan and starring John C. Reilly. Judd Apatow, director of The 40-Year-Old Virgin and Knocked Up, and Kasdan co-wrote and produced the film. The Dewey Cox persona borrows from several prolific figures in rock history: Bob Dylan, Elvis Presley, Roy Orbison, Jim Morrison, Brian Wilson, Glen Campbell, Ray Charles, Jerry Lee Lewis, Donovan, John Lennon, Sir Paul McCartney, George Harrison, and Ringo Starr, but mainly Johnny Cash. The plot echoes the storyline of 2005's Johnny Cash biopic Walk the Line; Walk Hard is also a parody of the biopic genre as a whole.